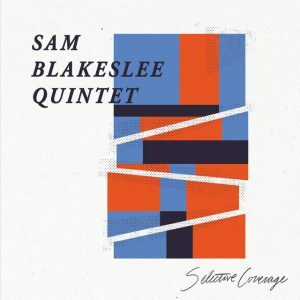 In October, New York City-based jazz trombonist and composer Sam Blakeslee released his debut album Selective Coverage with the Sam Blakeslee Quintet. Columbus native and recent Northeast Ohio resident Blakeslee recorded the album at Systems Two Studios in Brooklyn in September 2016 with Cincinnati-based guitarist Brandon Coleman and highly regarded NYC musicians Jorn Swart (piano), Cory Todd (bass), and Dan Pugach (drums). The album is now available in CD format here, and in CD/digital formats at CD Baby, iTunes, Amazon, Google Play, Spotify, and more. The band’s release tour continues next week with shows at The Golden Mean in Cincinnati on Saturday, November 25th and at Nighttown in Cleveland on Sunday, November 26th, and the band will return to Northeast Ohio in February 2018. Keep reading for my thoughts on this powerful release. Blakeslee has described the original compositions that comprise Selective Coverage as combining personal storytelling with social commentary, and those elements are evident in the themes, moods and atmosphere of the material. Opener “Going Back” starts things off in mellow yet swinging fashion, as Blakeslee’s smooth tone leads the way on both the melody, with well-placed harmony help from Coleman, and on a stately solo gliding gracefully over Swart and crew’s rhythmic base. The darker coloring of “Unfortunate Clarity” yields beautifully subdued results, with Swart’s reflective passage a particular highlight. “Gutter” opens with an extended unaccompanied statement from Blakeslee that leads into more chaotic territory for the quintet, with dramatic shifts in focus and energy conjuring the feeling of charging around corners into dark alleys. The calmer “To Forgive” finds Blakeslee and Coleman playing off of each other subtly and effectively, and gives both players room to explore the tune in muted fashion. The album’s second half starts with the title tune, which “is based on the unfair media coverage of minorities and the ongoing struggle to provide universal healthcare for all people.” A striking military cadence from Pugach announces the album’s centerpiece, and Blakeslee’s determined melody gives way to dynamic and yearning passages from Swart, Blakeslee and Coleman, with the leader’s passionate lines proving quite memorable. Blakeslee and Swart open “Always Finding Your Way” with a free-flowing duet that develops into a meandering tune that Todd and Pugach imbue with unpredictable energy. Closer “Settling In” ends the album on a sunnier note, with Blakeslee and Coleman again trading lines seamlessly and solo moments from the entire ensemble, capped by ascending fills by Pugach as the tune builds to a triumphant conclusion.